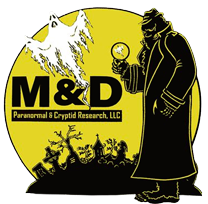 Our mission at M&D Paranormal and Cryptid Research LLC is to compassionately, knowledgeably, and professionally assist those who have been personally affected by a paranormal or cryptid experience, including those who have been indirectly affected. No matter the circumstances of the experience, we strive to offer a non-judgmental environment to promote education, open communication, and empathy to each client within our service. We vow that the needs, concerns, and safety of our clients always come first in any service we offer. M&D primarily offers services (free of charge, however donations are appreciated) for those who are having or have had paranormal or cryptid experiences in their home, business, or land and would like a professional investigation to be performed. Paranormal events are those which may be caused by: ghosts, spirits, energies, or other strange phenomena. Cryptid events may include encounters or signs by: bigfoot, dogman, mothman, aliens, or other strange creatures (click here to read “What is a cryptid?”). This can validate a personal experience by collecting supporting visual or audio evidence and, if requested, we can cleanse / clear a space to mitigate continued experiences. We are based in Asheville and Marion but service the entire Western North Carolina region and beyond. M&D also works with local area groups and business to promote the paranormal and cryptid fields to help dispel the stigma around these phenomena. This work includes: media appearances, historical and location-based research, educational presentations, and open investigations at known haunted locations. Our investigative equipment is the most advanced available in the paranormal field today (the same as you would see on any “ghost show” on major TV networks). We work with a state of the art night vision camera system, an SLR depth of field camera with figure mapping software, radio frequency scanner / ‘spirit box’, tri-field meters, and more. We are professionally trained, certified, and follow the scientific method in all our investigations. We do not elaborate or fabricate evidence and always seek to first glean a rational, tangible explanation of the event; once these are eliminated we will delve deeper into the paranormal realm. The above video Is from one of our monthly Paranormal Gatherings. These are done at our Brick and Mortar shop, called the Shop Ecclectic in Marion NC. 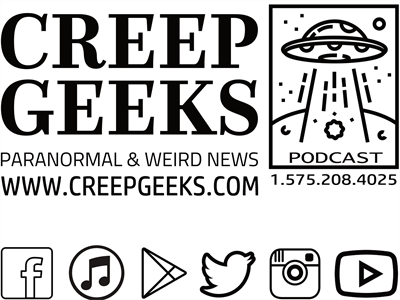 Each month we have a different presenter join us.This month it was the creep Geeks, from the podcast at https://www.creepgeeks.com, they regaled us with tales of their adventures in new Mexico, and many strange and unusual experiences they had. Check out the shop on Facebook at the shop Ecclectic for all of your spiritual eclectic needs!